Vincenzo Cabianca (Verona 1827 - Rome 1902). Biography. Of humble origins, Vincenzo Cabianca was born in Verona, where he first studied at the seminary and from 1842 at the Accademia di Belle Arti under Giovanni Caliari. In 1846 he went to the Accademia of Venice where he attended without great conviction Clementini’s lessons. The lagoon town didn’t leave visible traces in his painting except for a certain interest for the expressions of the Venetian XVIII Century and the beginning of the predilection for the genre subject, which would develop in later years. In 1848 he participated in the liberation revolt and in 1849 he took part in the defense of Bologna. In 1853, perhaps for political reasons, he moved to Florence, where together with Severini and Borrani he joined the rising macchiaioli group, attended the Caffé dell’Onore and then, from 1855, the famous Caffé Michelangelo. The first experiments of outdoor painting had no immediate consequence in his own painting, which until 1857/58 was tied to the compositional schemes and formal balance of the academic genre painting, as shown in the works which he exhibited in that period at the Florentine Promotrici. 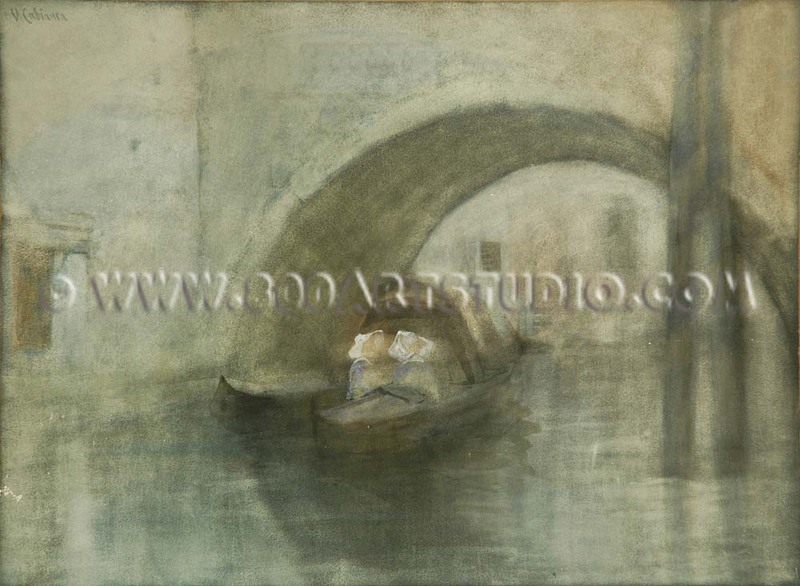 Cabianca however began to show more and more interest for the construction of the image through chromatic values and tones of light which was adapted first to genre paintings, such as “Abbandonata” (The Abandoned), 1857, and “Goldoni giovinetto” (The Young Goldoni), then during the Summer of 1858, which he spent in La Spezia with Signorini, to “en plein air” works. Between 1859 and 1860, together with Banti, he devoted himself to regular “painting expeditions” in the countryside between Montemurlo and Piantavigne, making long reflections and applying the new theories of the “macchia”. 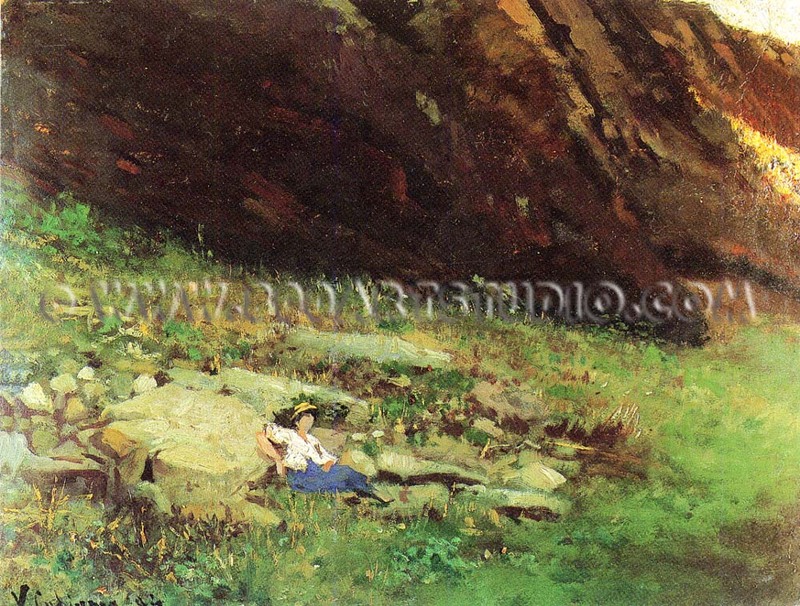 Paintings such as “Rovine di San Pietro a Portovenere” (Ruins of San Pietro in Portovenere) and “Le monachine” (The small Nuns), exhibited in Turin in 1861, are among his masterpieces and they make him one of the emblematic painters of the initial stage of the Macchiaioli story. In 1861 Cabianca visited Paris with Signorini without being particularly impressed by it; the following year he came back to Tuscany and painted in Montemurlo; however he didn’t abandon the hostorical-academic subject as shown by the painting “Novellieri fiorentini del secolo XIV” (Florentine Story-tellers of the XIV Century) which he brought to the Florence exposition of 1861. 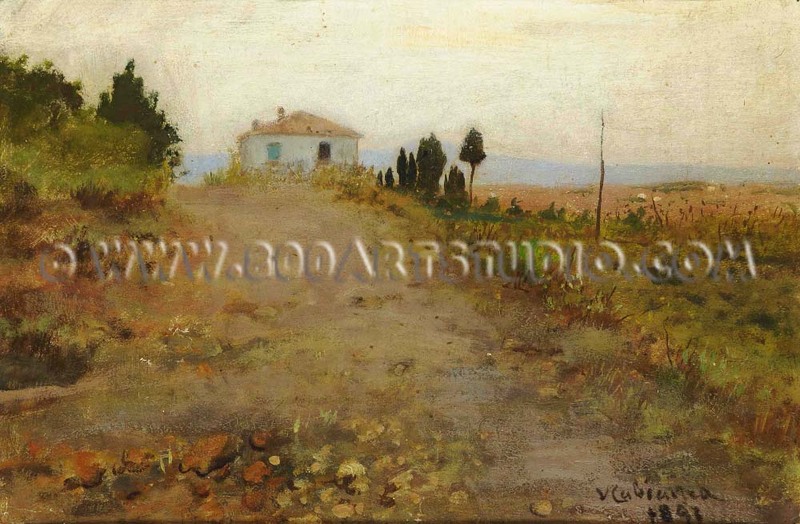 The academic component got more evident during his stay in Parma which lasted about seven years beginning 1863, with frequent visits to Florence and Rome, where he moved in 1870, becoming friend of Nino Costa and painting from life small works according to the Macchiaioli technique. In the abundant production of the 70s and 80s we find beautiful paintings dating back to the stay by Diego Martelli in Castiglioncello and many views of the countryside by Anzio and Nettuno. In 1876 he was among the founders of the “Watercolourist society”, in 1886 he subscribed to the antiacademic Roman group “In Arte Libertas” together with Coleman, Costa and De Maria. In 1893 a paralysis forced him to an almost complete inactivity.